Shale we or shale we not? I was intrigued by the letter below published recently in the Financial Times. 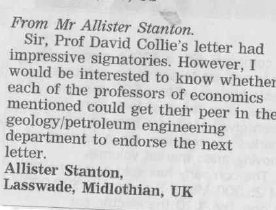 I have rarely seen such a letter, where so many economists are in agreement. It made me sceptical, especially since none of the signatories, apart from one from Lancaster, were from Northern Universities, and in particular none from the premier ones in this region. I don't know what I think about fracking (nor does my iPad's spellcheck, which tries to auto-correct it, and a lot of the opposition to it make play on its resemblance to a less than civil word). On the one hand, it brings me back to the story I have told my family several times which was that as a student in the early 1980s, reading engineering science at Cambridge, there were modules and current interest in the Energy crisis, and I read books and articles about the expiration by the Millennium of the world's oil and coal reserves; and green energies were starting to be explored. It was only about that time, just after the 1979 oil crisis, that production in the North Sea became technically feasible. My present view on fracking is mixed: yes, it would be wonderful to have a significant new source of power; but there seems to be evidence that earth tremors can be caused, and issues such as water pollution: so I am a Nimby, at least at present, on fracking. I was therefore pleased to see that the economists' letter didn't go unanswered, with their being two responses.